Product prices and availability are accurate as of 2019-03-21 17:34:42 EDT and are subject to change. Any price and availability information displayed on http://www.amazon.com/ at the time of purchase will apply to the purchase of this product. 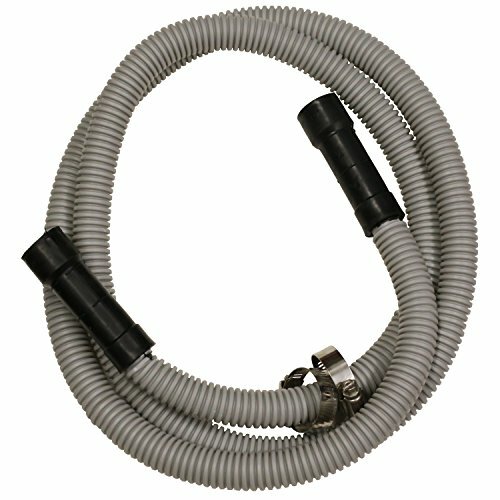 Lasco 16-1904 Dishwasher Flexible Poly Drain Hose, 78 Inches Long x 1.1 Diameter. Hose is made of corrugated flexible poly material and measures 78-inches long. Stepped size on connection ends fit 4 sizes of drain fittings: 1-inch, 7/8-inch, 5/8-inch or 3/4-inch fittings by simply trimming down from 1 inch to 7/8 inch, 3/4 Inches or 5/8-inch step. The ¾-inch step will stretch to fit the 7/8-inch fitting. Includes 2 stainless steel hose clamps. This universal flex hose is perfect replacement part for dishwasher drains. Corrugated Poly Flex hose material is 78-inches long and easily snakes along flooring, underneath and through cabinets from Outlets on Dishwasher to Air Gap, Disposal or Sink Drain. Made in China.